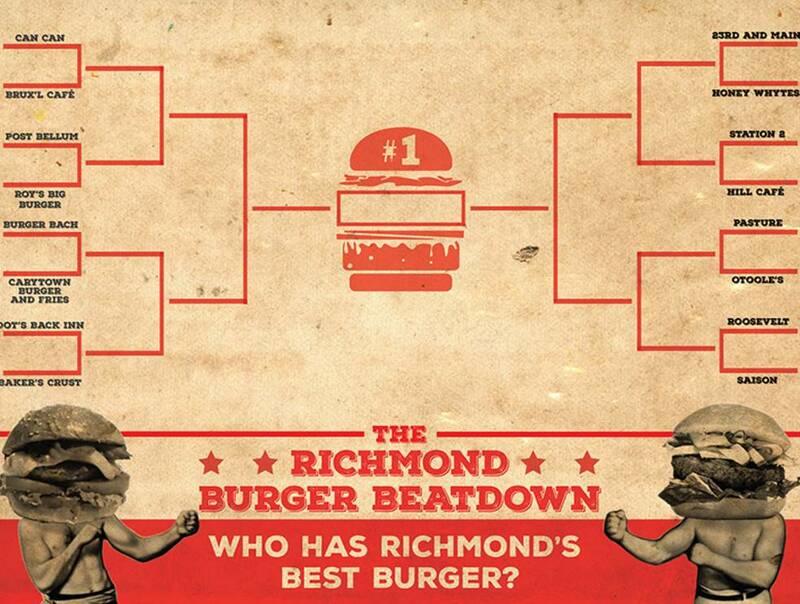 It’s time to find out who has the best burger in Richmond. Round 4 is a real humdinger, a rope-a-dope for the ages. In the West Division Dot&apos;s Back Inn takes on Baker&apos;s Crust While the Roosevelt and Saison battle in what is sure to be one of the round of 16&apos;s most hotly contested contests. Dot&apos;s Back Inn is such an institution that Guy Fieri visited the diner on his show Diners, Drive-ins and Dives and probably said things like "bam", "holy moly strombroli" and "I&apos;m driving the bus to flavor town." Baker&apos;s Crust comes to the table with a finely textured product that is naturally lean and nutritious, char-grilled and served on a brioche roll with fresh cut fries. The meat is grass-fed New Zealand beef fresh from Silver Fern Farms. The Roosevelt, Church Hill&apos;s own Rough Rider, is a darling of Richmond&apos;s culinary scene for good reason. Their burger comes with: double cheeseburger, bacon onion jam and rooster sauce and is one of Comfort Chef Travis Milton&apos;s favorite burgers in the city. Saison is the other beast in this clash of titans in the first round. Saison owner Jay Bayer channeled Hulk Hogan in praise of his outfit&apos;s burger: Weighing in at 6 ounces of Nadolski&apos;s ground sirloin beef, the flat top seared juiciness that is the Saison Burger sets fans in a frenzy and leaves foes forgotten. Saison Burger with Bacon,Chevre, and Fig Jam gonna reign supreme!" Don&apos;t miss the rest of the action. Subscribe now!